One of the greatest assets to the legalization of cannabis across the U.S. is the small business boom it is causing. While the industry that surrounds cannabis has been around for a long time now, legalization has seen an increase in demand. Lots of entrepreneurs are cashing in by creating businesses based around this growing niche market, and though the risks of getting shut down by the DEA are prevalent for many involved, the ancillary industry is proving valuable for commerce. Small companies catering to the edible market are especially booming, as more people are turning to non smokable alternatives. Cheeba Chews is a company that has been at the forefront of the edibles industry, with their high quality chocolate taffy and fruit gummies standing out as the preferred alternative to smoking for medicinal use patients. This award winning company has become synonymous with consistency, discretion, and effectiveness. Following suit in confectionaries, Bhang is a California based company that has been creating chocolates for high end grocery stores for years, and just recently have added medicinal chocolates to their repertoire. Their mission statement makes no bones about it, they are chocolatiers first, so you can expect a quality product.
" We have been a chocolatiers all along, that's very different than someone who buys boxes of brownie mix, throws in cannabis, bakes the stuff and sells it as medical marijuana." Dixie Elixirs is a Colorado company that has become a prominent name in the business, by carving out a corner for themselves in creating cannabis infused carbonated beverages. Their drinks come in bright fruity flavors such as pomegranate and peach, and have branched out to include flavored extracts and edibles. 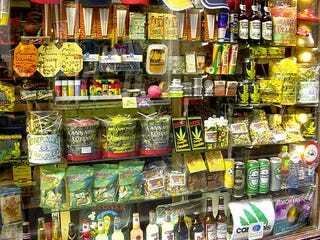 But food isn't the only industry taking off in the wake of legalization, businesses you would never even think to consider are now finding themselves catering to the growing market. Staffing agencies, insurance companies, and payment processors are all starting to cater to an industry that requires specialized skills. To meet with the demand of knowledgeable dispensary and industry employees, education has become an important aspect. After all, this is an industry that relies heavily on deep knowledge of horticulture, chemistry, and law in order to keep safe. Oaksterdam University in Oakland California boasts that it is "America's first cannabis college" and has a curriculum that includes everything from multiple classes on methods of ingestion, to politics and legal rights, to how to procure product and run your own business. The Care Wellness Center, based in Seattle, takes a different approach to education. Their focus is primarily on educating patients and business owners on health treatments, botany, and political advocacy. The fashion industry is another niche market within cannabis culture, thanks to the increasing production of hemp. Textile companies such as EnviroTextiles are now catering to mainstream designers such as Ralph Lauren and Versace to create hemp silk blends, as well as developing all natural alternatives to synthetics for industrial use. Subscription box companies have also joined the fray, with companies like Cannabox and Burn Box offering surprise samples and full size products such as pipes and grinders, as well as hemp products straight to your doorstep. The cannabis industry is growing fast as more demand is being made for things far beyond paraphernalia. Small businesses are starting to make an impact on bigger companies in commerce, and the trajectory only seems to be going up for now. WE DID IT! WE ARE MOVING!! !